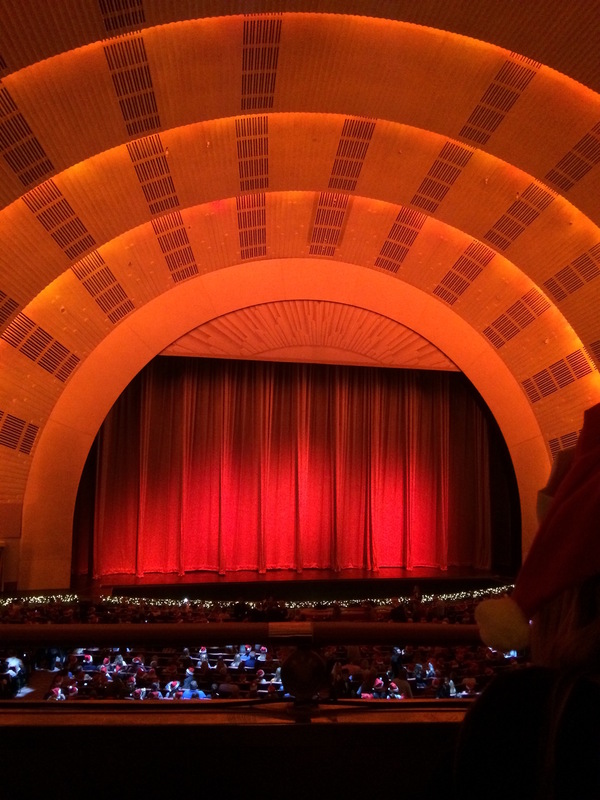 While on our early morning backstage tour of Radio City Music Hall today, I met two delightful ladies from Scotland who marveled with me at each nook and cranny of the iconic 1932 Art Deco structure. The majestically rich history of legendary performers alone is breathtaking, with each back hallway and secret corridor filled to capacity, representing all genres of musical entertainments. As Santa himself explained during the 90-minute Christmas Spectacular performance last night, the most famous “seasonal stockings” of all time represent the splendor and magic of this historic landmark: The Rockettes! So, I know you’re wondering now… What do The Rockettes have to do with the two ladies from Scotland? One of these dear ladies (originally from Inverness, up in the northern area) was a former Rockette in “another lifetime, my dear.” While taking our restroom break (another unique experience with pedestal sinks and the original foot-pedal hand dryers from 1932! ), we struck up a lively conversation, the type a dear friend of mine calls a “visitation.” Elspeth talked about “seeing this building for the first time today.” When I asked her to elaborate, she observed, “When you land the coveted opportunity to work for this company and create a sense of teamwork for several shows a day during an intense period of time, you focus on each performance so intensely you forget to really appreciate the special and spectacular moments surrounding you…I can look back fondly and marvel at the magnitude at this point in my life…it’s given me a level of gratefulness I never knew existed so deep within my soul…” WOW! In that one moment, her powerful wisdom sprinkled with her obvious attitude of gratitude helped her (and me) lift the cloak of indivisibility to gratefully appreciate her personal experience as a real Rockette and me to focus more on looking at daily experiences from the perspective of them being the first time. This is definitely a restroom break that will resonate for a while! Perhaps, being able to simply see things “for the first time” helps us to not work so hard at experiencing daily gratefulness. Gratitude becomes a natural response every time, thus opening our eyes to the plentiful bounty within our lives. So here’s your challenge today: Think of a “visitation” in your life experience. What did this person gratefully share with you to enlighten your situation in that time together?